Flu season in the U.S. is off to its earliest start in nearly a decade — and it could be a bad one. NEW YORK — Flu season in the U.S. is off to its earliest start in nearly a decade — and it could be a bad one. 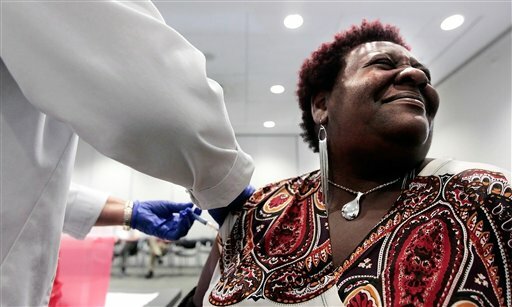 Health officials on Monday said suspected flu cases have jumped in five Southern states, and the primary strain circulating tends to make people sicker than other types. It is particularly hard on the elderly. “It looks like it’s shaping up to be a bad flu season, but only time will tell,” said Dr. Thomas Frieden, director of the Centers for Disease Control and Prevention. The good news is that the nation seems fairly well prepared, Frieden said. More than a third of Americans have been vaccinated, and the vaccine formulated for this year is well-matched to the strains of the virus seen so far, CDC officials said. Higher-than-normal reports of flu have come in from Alabama, Louisiana, Mississippi, Tennessee and Texas. An uptick like this usually doesn’t happen until after Christmas. Flu-related hospitalizations are also rising earlier than usual, and there have already been two deaths in children. Hospitals and urgent care centers in northern Alabama have been bustling. “Fortunately, the cases have been relatively mild,” said Dr. Henry Wang, an emergency medicine physician at the University of Alabama at Birmingham. Parts of Georgia have seen a boom in traffic, too. It’s not clear why the flu is showing up so early, or how long it will stay. “My advice is: Get the vaccine now,” said Dr. James Steinberg, an Emory University infectious diseases specialist in Atlanta. The last time a conventional flu season started this early was the winter of 2003-04, which proved to be one of the most lethal seasons in the past 35 years, with more than 48,000 deaths. The dominant type of flu back then was the same one seen this year. One key difference between then and now: In 2003-04, the vaccine was poorly matched to the predominant flu strain. Also, there’s more vaccine now, and vaccination rates have risen for the general public and for key groups such as pregnant women and health care workers. An estimated 112 million Americans have been vaccinated so far, the CDC said. Flu vaccinations are recommended for everyone 6 months or older. On average, about 24,000 Americans die each flu season, according to the CDC. Flu usually peaks in midwinter. Symptoms can include fever, cough, runny nose, head and body aches and fatigue. Some people also suffer vomiting and diarrhea, and some develop pneumonia or other severe complications. A strain of swine flu that hit in 2009 caused a wave of cases in the spring and then again in the early fall. But that was considered a unique type of flu, distinct from the conventional strains that circulate every year.